Making Muskoka beautiful one pet at a time! Full Paw'tential Pet Grooming is Gravenhurst's newest, modern grooming salon offering dog and cat grooming services for all breeds and sizes. 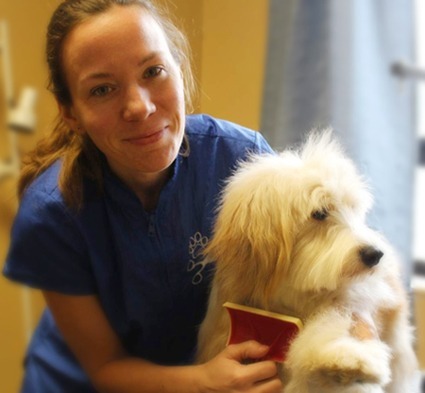 At our salon, you will find a clean, welcoming environment for your furry friend. We provide personalized service by a certified professional groomer with several years experience in the pet industry who come veterinarian recommended. Our owner/operator, Willow Robinson, graduated with honours and continues to keep up to date on the latest equipment and styles through trade shows, seminars, online education, and mentorship to keep your best friend looking and feeling fur-tastic. Full Paw'tential's services range from full grooming packages to individualized options based on your pet's needs and your requests. Our aim is a positive, loving experience for your best friend while meeting the highest quality standards. We believe that healthy paws are happy paws—and when you see your groomed pet strutting out to greet you upon pickup, you'll believe it too! Let Us Help Your Pet Reach Their Full Paw'tential! Just wanted to let you know we love Ted’s coat like this!! He looks so young lol!! What a difference. They are both perfect! They seem very comfortable with you, which is important to me. Thank you for making the girls’ time there an enjoyable experience. Willow, we are so pleased with your work. Once again, thank you from the bottom of our hearts for your wonderful talent and your caring for our babies. Those pictures of you and Teddy made us smile! Whew, what a mess he was, but he sure did look lovely when you brought him home! Thank you for the lovely photo. Eleonore looks marvelous! She reminds me of plush velvet. Wow! Thanks for the pictures and the grooming! She looks a million times better. We will definitely be back and recommending your business! Just wanted to let you know how happy I am with how the girls look, feel, and smell. Once again, you outdid yourself! Fantastic job!